Do you remember your first big step in MX? Was it your first holeshot? Your first win? Well Jen Miller probably has a few of her own. However, the whole M.A.M.A. season was a big step for her. She placed 2nd in the Women’s 80s and 2nd in Overall Novice Rider and a Sportsmanship Award, not bad. I say it’s amazing considering this is only Jen’s 3rd year on a bike. Jen keeps herself busy during the spring with Softball. She has made the tough choice to probably give up Motocross when she gets out of High School, but for the right reason: college. So. She has her head squarely on her shoulders. She has worked hard with the support of her family to reach this far, but she’s having fun. After all, isn’t that all girls just want? 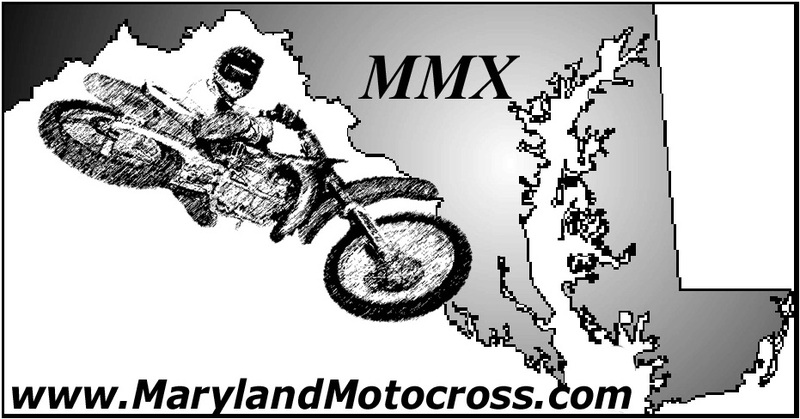 MarylandMotocross.com: Hello, May I speak to Jennifer Miller please? MM.com: Jennifer Miller, are your parents home? MM.com: Hello, My name is Peter Downing, I’m with the Internal Revenue Service for the State of Maryland. MM.com: You recently won a Dirt Bike correct? MM.com: Were you not informed that you were supposed to turn in some forms to us regarding the tax exemption? MM.com: I’m just asking because your name is here on the receipt and you may be fined for not turning these forms in. JM: Didn’t you… Didn’t you just tell me your last name was something else? JM: Like a minute ago? MM.com: I’m pretty sure I didn’t M’am, I’ve had this name my whole life. JM: (To Parents) Pete Sylinner. MM.com: No, I’m just kidding it’s Ese’ from MarylandMotocross.com, how ya doin’? MM.com: Did I get ya? JM: Yeah, yeah you did. MM.com: I was going to do the bad guy from Scream, but when I do, the Cops usually get involved. I took Drama Class and Criminal Justice for a semester In college. JM: (Laugh) Yeah…I wouldn’t think those two would have anything to do with each other. MM.com: Oh yeah ever heard of a little lady named Wynonna Rider? Okay Jen, first off, how old are you and how long have you been riding? JM: I’m 15 and this is my 3rd year riding. MM.com: Great, Now lets hear your number and is there a reason that you chose that particular one? JM: 25 and it’s what they assigned me, so… I had it my first and 2nd year and they told me I had to have it this year. MM.com: Awesome, now I’m going to jump right to the meat and poh-ta-toes, or poh-tah-toes if you prefer and say cause I took English for a semester in college. 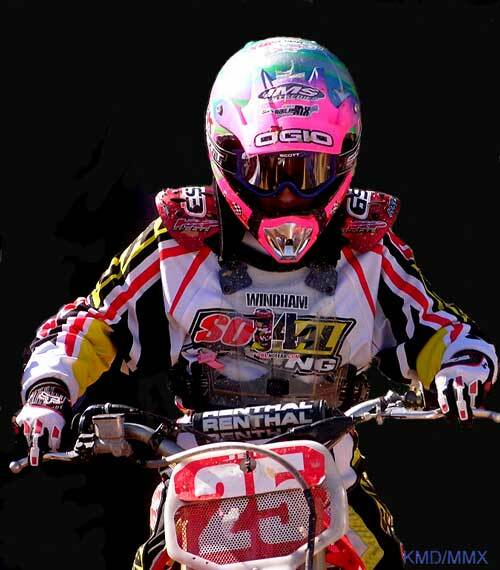 Y2K4 was sort of a break out year for you in Motocross, was it not? MM.com: Now at the Middle Atlantic Motocross Association Banquet, you won a couple things and they were? JM: I got 2nd in the 80s and 2nd in the overall novice rider and I won the bike. JM: (Laugh) Oh yeah; that too. MM.com: That’s the most awards you’ve ever won at the Banquet, correct? MM.com: The bike you won was a door prize and it was a…? JM: It was a KX 85. MM.com: Are you trading it in? JM: No we’re selling it. MM.com: How much, so I can give you some free advertising. (To parent) Dad, how much for the bike? MM.com: May I suggest $2800.99, the 99 kinda catches people’s eye… I took advertising for a semester in college. MM.com: Great, so how do you feel about the way your career, thus far, is progressing? JM: It’s going good. I’m having fun. MM.com: Speaking of fun, tell me what a motocross day in the life of Jen Miller involves? JM: You mean my routine? MM.com: Pretty much from the time you wake up. JM: I get up at 6:30. I go to signup. I get my bike ready, I get dressed in my ge… Please be quiet. JM: (Laugh) No, I’m talking to my brother. And then, I get ready for practice. Then do the motos. MM.com: What would you say is your favorite memory in motocross? JM: When I met Travis Pastrana at the Nationals. He came Monday after the Nationals in 2000. He just hung out and gave autographs and stuff. MM.com: He’s a pretty kewl guy. So then, what is your worst memory in motocross? 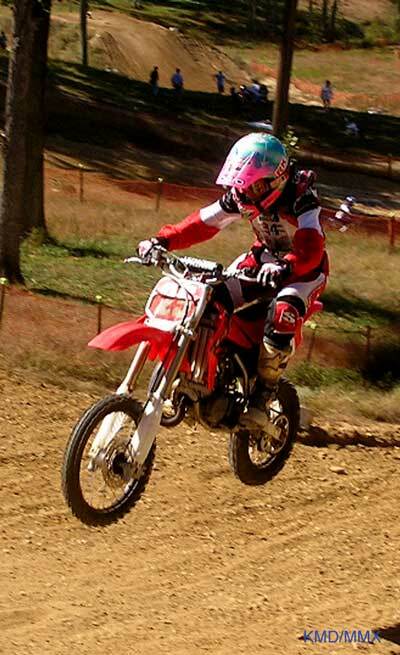 JM: When I fell in the second to last race in the holeshot in Women’s class. MM.com: So, when Jen Miller is not riding Motocross, what does she do? JM: In the Spring I play softball. MM.com: What position do you play? MM.com: Sweet, I did Lacrosse and took Jujitsu for a semester in college, each was off season training for the other; is Softball kind of your off season to help you keep in shape for MX? JM: Yeah I guess so, you could say, but I also just like playing it. We do a lot of work. MM.com: If you had the power for one day to change anything in Motocross, what would Jen Miller change? JM: Nothing really. (Pause) Well, maybe, the expenses like signup and stuff. It’s kinda a lot. The bikes are expensive. MM.com: They sure are. Do you have any close friends in Motocross? JM: Not really. I just hang out. MM.com: Is there anyone famous that you’d like to meet that you haven’t yet? JM: I… guess the guys from Blink 182. MM.com: They’re kewl. I took Pop Culture for a semester in college. Do you have any advice for anyone new to the sport? JM: Just have fun, if you aren’t having fun, you shouldn’t be doing it. MM.com: What’s your favorite track to ride at? JM: I like Virginia Motor Sports a lot. MM.com: Any events throughout the year you look forward to or like the most? JM: I was supposed to go to Texas and race the WMA cup, but it didn’t work out, but I think I am next year. MM.com: Well, hopefully next year is going to be even better than this year; you did really awesome this year. MM.com: You seem kinda quiet, do you remember when we met you? JM: Yeah. At Seaford. That was cool. MM.com: I thought we were bothering you. JM: No, I’m just really quiet, I guess till you get to know me. MM.com: It’s pretty tough being a rider, how far do you plan on taking it? Are you going to see how it goes the next couple years and maybe turn Pro? JM: I’ll probably ride till I’m done with High School. Then I’m going to college. MM.com: Good for you. Education first. 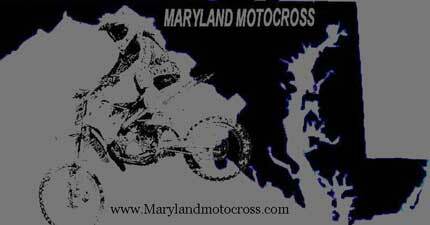 Got anything to say to the Maryland riders out there. JM: Ummm…(Pause, laugh) Not really. MM.com: Well, here’s your assignment, I was a professor’s aid for a semester in college, think of something to say and let me know what it is next time at the track.